This article first appeared on the Independent Australia website. "Courage under pressure, ingenuity in adversity, bonds of mateship and, above all, loyalty to Australia." In 1941, defence-in-depth ‘ingenuity’ enabled our World War II ‘Rats of Tobruk’ diggers to stop Field Marshall Erwin Rommel’s blitzkrieg for 240 days, giving the 8th Army time for the next offensive. Using this same spirit of ingenuity today, we can stop such widespread bush fire destruction for a new generation of Australians. Fire trail problems add significant Workplace Health & Safety (WHS) risks to fire-fighters. "During this inspection the Committee experienced the great difficulty of travelling over deep channels, or ‘tank traps’ as they are known locally, that were deliberately built into the trails after the fires to discourage access. 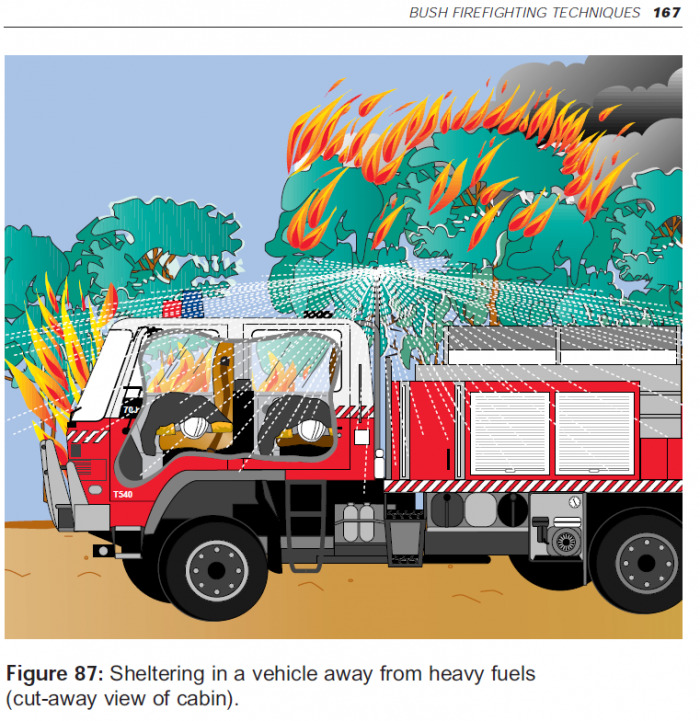 These are problems often encountered by fire-fighters in reconnaissance tasks during fire-fighting tasks." Every Australian fire-fighting appliance requires a turning bay for escape in case the fire trail is blocked by fire, fallen trees or ‘tank traps’ deliberately built by local forestry people. If fire-fighters cannot turn vehicles around they can be trapped and in mortal danger. The larger fire-fighting tankers require a turning circle of 22 metres to get back out of danger. Fire trails with turning bays and refuges are extremely rare. The proposed tracked AST vehicles have bulldozer blades to clear fire trails, push detours around large obstacles, fill-up deep ditches with soil. Best of all, tracked vehicles turn within their own length. Wasting 9 days in fire trail preparation during bushfire emergencies is clearly avoidable with AST support. Time wasting like this puts fire-fighter and community lives at risk. These acts have been conducted by ‘well-meaning’ environmental groups and Government Agencies & Authorities. Narrow tracks such as the Ingar fire trail (above) in the Blue Mountains are only suitable for single lane ‘traffic’ of firefighting vehicles. They are also used for recreational purposes and users can then report to Rural Fire Service [RFS] personnel about any problems with trail conditions. The only viable Plan B in cases where crew become trapped is an immediate call to aircrew for water-bombing aircraft (the ‘Elvis’ Skycrane). A more reliable Plan B is for Armoured Strike Teams – including the Leopard 1 fire-fighting tank with a massive 20,000 litres capacity – to fill this critical emergency-response gap. The above graphic shows the last remaining option for fire-fighters when proper fire-trail management is ignored or sabotaged. 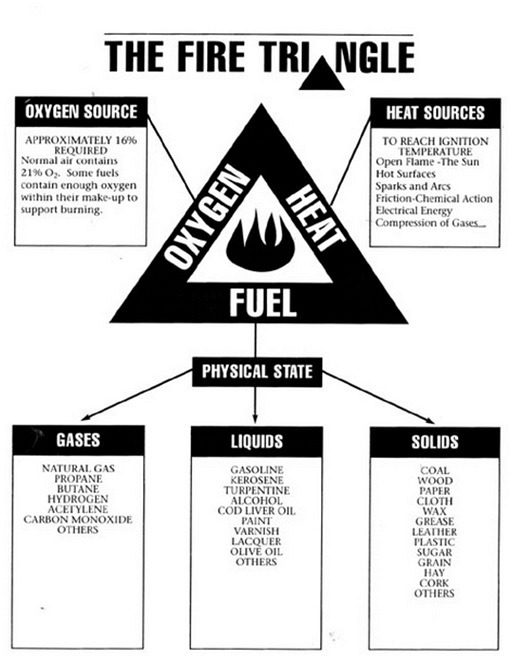 The aim of fire-fighting is to break the triangle, thereby separating each element from the other. For example, without oxygen the fire cannot burn and the flames will soon die down. When we take heat out of the fire, the fuel burns at a slower rate making the fire easier to contain and extinguish. Modern fire-fighting techniques combine water + fire suppressing compounds to create a foam/fluid compound. The foam blankets the fuel surface, starving it of oxygen and thereby smothering the fire. This foam blanket also separates the flames/ignition source from the fuel surface, cools the fuel and suppresses the release of flammable vapours that can mix with air. 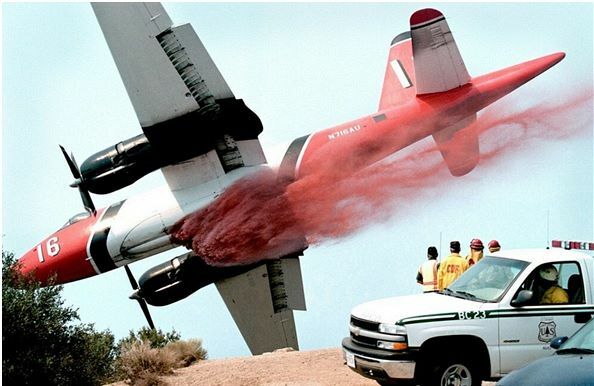 The dramatic image (above) of a US water bomber dropping retardant down the side of a hill and the Elvis Skycrane in the recent Blue Mountains bushfire clearly show the skill levels demanded in aerial fire-fighting. Prescribed or controlled burning is another method used to reduce the severity of uncontrollable bushfires. Recent studies have shown significant differences between Aboriginal and European management of fires in our forests. Following European settlement, fire exclusion and suppression was a common practice in more highly developed areas, whilst deliberate burning was used in many outlying areas to reduce fire hazards or maintain grazing values. The frequency of intense fires in forests increased following European settlement. The research was conducted in forests around Eden and the Snowy Mountains regions of NSW, with similar findings. Ward et al. demonstrated a decline from about three fires per decade under Aboriginal management to about one fire per decade under post European management of jarrah forests. During the same time, the average frequency of fires sufficiently intense to cause scarring on trees increased from one in 82 years to one in 13 years [Burrows et al.1995]. Thus, under a ‘fire exclusion’ policy, every fire in jarrah forest was sufficiently intense to cause some fire scarring of established trees. Additional research indicates that, by the early 20th century, forestry management practices began a policy to increasingly suppress and stop any forest fires, even when they were of low intensity and more like prescribed fuel reduction burns. Extensive, and often disastrous, wildfires in all States around the middle of the century demonstrated the futility of these fire exclusion policies [Florence 1994]. After this, there was another policy change, whereby extensive fuel reduction burning was introduced with a new system of aerial ignition being widely used. In the late 20th century, conservationists and similar groups objected to such broadscale hazard reduction programs as they considered there was a conflict with biodiversity conservation. forest health are extensive in south eastern Australia (Gleadow and Ashton 1981, Rose 1997, Lunt 1998, Jurskis 2000, Jurskis and Turner 2002). The structural change s that are occurring in formerly grassy and open eucalypt forests are reducing the chance that low intensity fires will burn through these forests, making prescribed burning more difficult, and making wildfire control increasingly difficult and dangerous. This further supports the inclusion of armoured strike teams in our fire-fighting arsenal. Back-burning is another valuable tool in the fire-fighters arsenal. The aim is to fight fire with fire. A controlled, low-heat fire is deliberately started by fire-fighters in front of an approaching, out-of-control bush fire. When the uncontrollable bush fire surges into the back-burned zone, there is very little fuel left and the bush fire intensity is significantly reduced. After back-burning, this fire can then be more easily controlled and then extinguished. The success of the 1941 Tobruk Garrison in assaulting and defending against the blitzkrieg attacks hinged upon a solid defence-in-depth strategy. 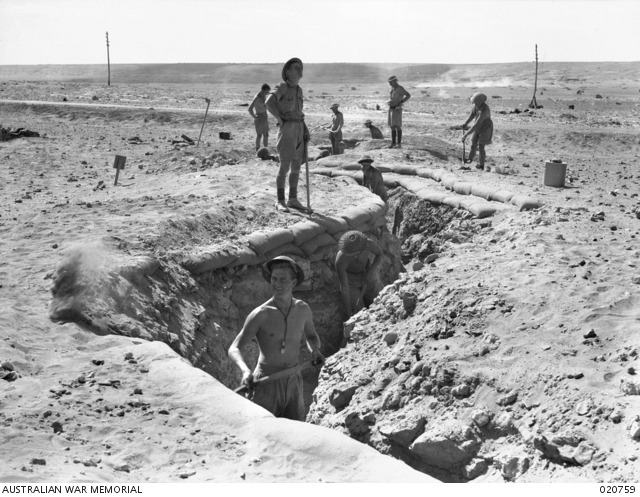 Our soldiers at Tobruk dug anti-tank ditches as part of such a defence against blitzkrieg. When we adapt this defensive principle in a modern fire-fighting strategy today by using backburning strategies to weaken, delay and then fires in bushland before they reach our communities. This prevents smaller fires become raging firestorms. Such huge fires cannot be stopped by any number of dedicated fire-fighters. This explains why our ‘firies’ must have safe access to the heart of forests and bushlands. These fire-fighting phases – advance to contact – the assault – the defence – and fighting withdrawal, are used to protect our lives and our communities. The Australian Defence Force [ADF] know these elements by another name – war-fighting phases. The key to success in both endeavours is utilising modern state-of-the-art equipment and up-to-date tactics that enables a rapid response to every threat.